We are very pleased to introduce you to E-Shish e-liquids. As the name suggests they have been developed to emulate the delicious fruity flavours which are so popular in the shisha world – but designed for vapers not smokers. And boy have they done a good job!! These are some of the most realistic and mouth watering fruit flavours we have ever tried. These are not just e-liquids, these are gourmet e-liquids! The fruity concoction of sweet pomegranate & zesty citrus fruits will give you the ultimate all day vape. This exquisite e juice flavour packs a punch and will leave you feeling truly exhilarated. 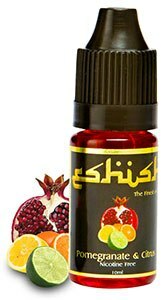 E-Shish e-liquids use a mix of 80% PG and 20% VG to ensure the optimum in flavour whilst still maintaining good vapour production and a great throat hit. The various combinations are superbly balanced to give real depth of flavour with distinct layers and different notes on the inhale and the exhale. These are truly delicious e-liquids and a must try for any fruit flavour fan.